Economy and ecology unite in today’s timber industry. A downturn in recent years has caused Oregon lumber companies to make adjustments and look to value-added products. The company was started in 1936 by his father, A.J. Frank, with a couple of small mills on the Little North Fork. The Mill City plant opened in 1955 and today employs about 120 people. Frank Lumber Co.’s primary product is kiln-dried Douglas fir cut into dimension lumber that’s used for home building and other light construction. In recent months, the company looked toward expanding its operations by manufacturing pellets for wood-burning stoves for home heating. “Pellets are becoming popular,” Frank said. They have a high BTU heat value and are made with waste wood, without additives. Manufacturing them would be an additional way for the mill to make use of its byproducts and stay ecologically conscious. Frank Lumber Co. has been selling its residuals – chips, sawdust and planer shavings – to paper companies and particle board manufacturers. It also takes the bark of its lumber-producing trees, and burns it to fuel the drying kilns. 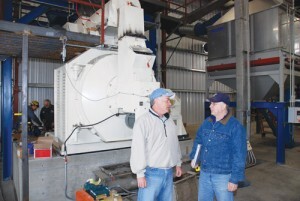 “We don’t throw anything away,” Frank said, so it was felt making pellets would be a good addition to the business. “We view them as a value-added product – there’s nothing wasted,” he said. Frank said because his mill’s lumber is kiln dried, the planer shavings are very dry – just the right moisture content for pellets – so pellet-making was a natural fit. The company organized its subsidiary, Frank Pellets LLC., and operations began in late October after eight months of preparation and construction. A 60 x 100-foot structure was built to house the raw planer shavings and there’s a 100 x 250-foot building for the main processing plant. The plant opened with one processing line, but there’s room in the building to possibly add another one in the future. The building project itself aided the economic base of the region by using a local engineer, construction firm, electricians and other workers. And five new jobs were created to run the processing plant. In addition to helping the local economy, making pellets enhances ecology by keeping wood waste products out of the landfill. The manufacturing process is “green.” Dust is captured, emissions are collected and screened, and any solid particles are run through the system again. Frank Pellets Co. expects to make about 50 tons a day. The product, called Packsaddle Pellets for a favorite North Santiam location, is marketed to farm stores and building supply stores. About one 40-pound bag of pellets a day will keep a home warm. Burning them is clean, quiet and creates very little ash. “Pellets stoves are seen as a very green way to heat a home. And, especially with rising oil prices, they’re economical,” Frank said. There’s an increasing interest in pellets as fuel and more plants are being built to meet consumers’ needs. Frank said there used to be four pellet-making companies in Oregon; one is being built in Roseburg, and with Frank Pellets, there are about eight manufacturers now. “We think it’s going to be a good thing for us,” he said.